"I was skeptical based on the feedback however I have been using each evening and I have much less tension in my back. Glad I made the purchase. " "It relieves the tension and is slightly addictive!" "Not quite the same as visiting a really good masseuse, but for the price of one short massage I can get a decent massage whenever I want at home. My back has thanked me for it so far." "I love the wheels, they do wonders. The design is very simple, yet effective. I just wonder why I paid so much, but I suppose that's my own fault. To be fair to buyers, I feel they should be cheaper, but that aside it is a great product! Even my chiropractor was interested when I showed him." "Love the product. I already feel relief." Best Investment my back feels so much better! "Watching the additional videos helped so much. I'm so grateful for those videos..it helps to know that you're using the wheels correctly and my back feels so relieved after each session. It's in my daily routine now!" "I was optimistic that this product would give some relief of my back pain, but I never thought I'd get this much relief this quickly. It was to the point where I couldn't hold my hands out to wash them, I'd have to lean on the sink, wash my hand then push myself back upright. After my first use I felt better, it's been less than a week and my back is almost pain free, and my mobility is 100% better. I only wish I would have purchased this sooner. Can't say enough good things. Thank you!!" "My 80yr old mother was very intrigued when my set arrived. After spotting her on the Gentle wheel, she loves it and uses it often. I love the Medium wheel and will work up to the Deep tissue wheel. These are terrific and well worth it!!" "My husband and I LOVE the Plexus Wheels. We use them on the floor and behind our backs when we sit for long periods of time. Great product." "Focus on core strength, tight abs and center core and pelvic position for each move! Develope structure first, strength and then flexibility. Great product!" "Although it’s just a wheel you can use it in different ways. Which is really cool. My boyfriend was skeptical of it and so was his brother. My boyfriend and I have bad backs. Between me having scoliosis and him having two heriniated discs in his back this is great thing for the inbetween chiropractor visits. The 6’’ deep tissue plexus is amazing. Doesn’t hurt and so easy to use. You can use it literally anywhere just as long as you have about a foot of empty wall or a place where you can lay down on the floor. We haven’t tried the stretches yet they sent in an email but will when I have a day off. " "Don’t let the simplicity of these fool you. They are exactly what you need for stretching and messaging. They are great for pre-workout warm up and post-workout cool down. Even if you just need to relieve tension, these are the right tool." Different from standard foam roller. "I do not have back pain, YET, and I want to keep it that way. I am happy with my purchase. I can feel an immediate difference between the Plexus+ wheels and a standard foam roller! I have started using this at least once per day to keep my spine feeling limber!" "I have minor scoliosis, and this helps so much with my daily physical therapy and relives a lot of back pain. Thank you." "Overall, I was pleasantly surprised by the plexus wheels. I have a lot of upper back pain from poor posture sitting at a desk all day, and knew I needed something to help stretch out the muscles in my back. Not going to lie, the first week of using the wheel was borderline painful, but I told myself I would have to give it about two whole weeks to give it a fair shot, and stuck to only using the large wheel which is supposed to be the least pressure. By the time the second week had started, while it still feels a bit unnatural, it is no longer painful and I noticed that I was able to take longer, deeper breaths than I had before I started. Who knew that my strained back muscles were making it harder to breath? After the second week, I started experimenting with the smaller wheels and I am now able to work my way down the smallest wheel to really work the muscles in my upper back. My back seems to crack easier now, and I can honestly say I can feel the difference when I forgot to use them for a day or two. I wouldn't quite call it a miracle solution for true deep back pain, but it has definitely helped me live a better life with less back pain. The only negative I can say is there was an issue with the shipping. This is understandable as it was ordered not long after Christmas so I can understand that perhaps they needed to resupply, however, great communication with your customers may be helpful, as it got to the point that we weren't sure we were ever going to get to try these little wheels!" "I work in a field that is sometimes pretty physically demanding and the plexus wheel has been a game changer for my back pain. I like having the multiple sizes and I use them at least once a day. I recently missed a couple of days due to a very busy schedule and I could definitely tell a difference. " "Finally able to release my thoracic spine between my shoulders between chiropractic visits ! My chiropractor tried them and was so impressed he asked me to send him the link. David. Australia." "The product is great and I purchased after testing it once. It arrived before the expected delivery date. I would recommend this to anyone who need to loosen their back muscles. " "Awesome! It has helped my pain tremendously"
"Fairly young man here, has herniated and bulging disc. I was getting treatment but couldnt find time to go to gym to exercise. This this works, not necessarily solved my back issue immediately but I can feel my spine and lumbar back getting stretched with Chirp! With this and treatment from my doctor, I can finally tie my shoelaces, walk and do things where I couldnt do these things on my own!" "very good. works great "
"Easy and comfortable to use, just make sure you have space behind you to roll backwards. I found that the smaller wheel was much better at getting my back aligned, but the wheel cant quite get my upper back as I would like it to." Wish I had this sooner!! "I have seen huge improvement with daily use. Lumbar fusion is cancelled. :)"
"Took it out of the box as soon as it arrived as I’ve been having back and neck problems. I couldn’t believe how well this product works! Definitely one of the best buys I’ve made! " "This is an amazing product. It definitely hurts in a good kinda way. My back is feeling much better after a week of use. " "Great product!......I'm actually able to avoid going to my chiropractor oftentimes by pushing my rib back in place using the 6" Plexus Wheel +!" Finally a solution to my back pain!! "I work in an office and my back just seemed to be getting worse and worse! I saw the add on Facebook and thought it was too funny not to try it out! And it’s the best purchase I’ve ever made! I use it to stretch my back every night before bed and it’s instant relief and helps me sleep better through the night. 10/10!!!" 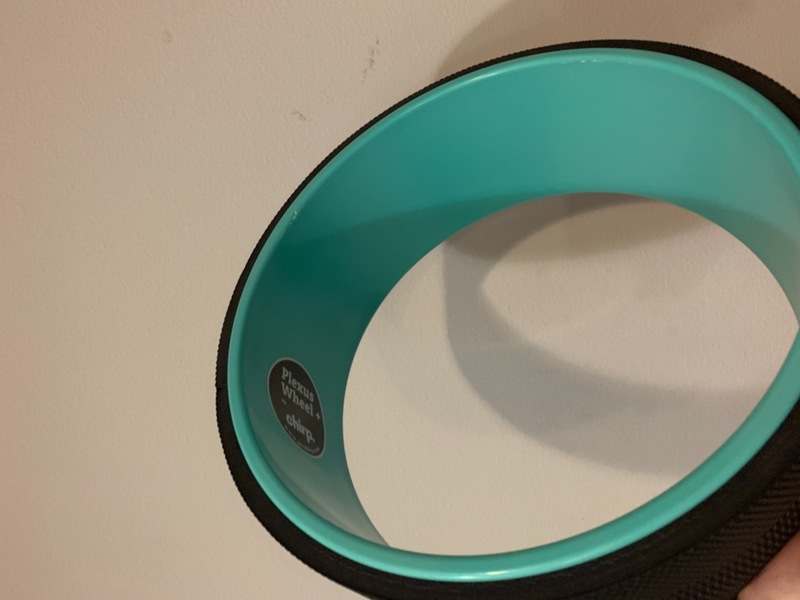 "I have used a lot of different rollers/tools for my back over the years and this is definitely the best and most effective one I've ever used. It really gets into the area to loosen muscles and help with alignment. It took awhile to be delivered but worth the wait!" "I used the roller about 5 minutes after it showed up at my house, and I got immediate relief. Ihave been using the roller every day since I got it, and the joy I’m getting from just being able to bend over to pick up things or playing with my kids has made me a believer. This is a great product." Plexus wheel helps with back pain. "Good experience with the plexus wheel,works well."